Opening hours: Shops are generally open Mon-Fri 10am-6pm and Sat 10am-3pm. Supermarkets and shopping malls may stay open until 10pm. Shops open on Sundays at their own discretion. 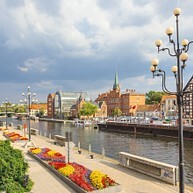 Bydgoszcz offers many interesting attractions due to its long history, which dates back to the Middle Ages. The past has left many traces around the city. You will find museums, beautiful gardens and cathedrals. Don't miss the Old Town Square, The City Walls and the canals around the city. 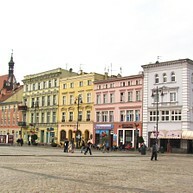 The Old Town Square, "Stary Rynek" in Polish, is located in the heart of Bydgoszcz. It hosts beautiful casements and the Town Hall. 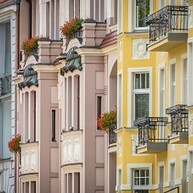 This enchanting place is renowned for its 19th century fin de siècle architecture: a local interpretation of the Art Deco and Jugendstil movements, known as Bydgoszcz Secession. Located on the northern side of the river, not very far from the Bydgoszcz Bus Station, this basilica is one of the biggest in Poland. It was designed at the end of the second world war in a neoclassic revival style. It also hosts a monastery and a park. The spacious, richly decorated interior will take your breath away. 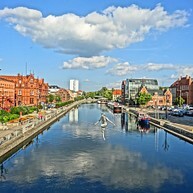 The Old Bydgoszcz Canal is an impressive engineering work from the late eighteenth century. An important commercial route in the past, it spreads for around 25 km and connects the Vistula and Oder rivers. The boulevard alongside the canal is a favourite among locals for afternoon walks with a beautiful scenery. Surrounded by the Brda River, Mill Island is a cultural and recreational hub in the heart of the city. Here picturesque mill buildings from the end of the nineteenth century stand along cobbled tree-lined streets. There are a number of interesting museums to explore in the area. These Prussian granaries are part of Bydgoszcz’s heritage and the town’s emblem.They house a museum dedicated to the painter Leon Wyczółkowski, who had a crucial role in two art movements in the early 20th century: the Polish realism and the local modernist wave, called Young Poland. A vast collection of his works is on display inside. The Phonographic Museum is part of the Leon Wyczółkowski Museum, and the only one of its kind in Poland. It showcases an assortment of various music players including gramophones, radio receivers, and cassette players, as well as a vinyl collection. Built in the 15th century to defend the city from raids by the Teutonic Knights, these fragments of the original fortification will allow you to step back in time to an unstable yet fascinating age. As you explore the nooks and crannies of the Old Town, it is worth taking a moment to step into the peaceful interior of this Gothic church. The building was completed at the start of the 17th century for the order of the Poor Clares. 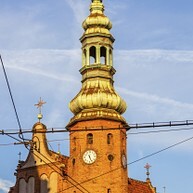 The Hejnał, a trumpet hymn to the Virgin Mary, is played from the old church tower at 12pm, 3pm and 6pm. 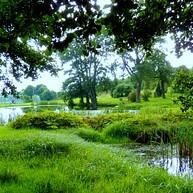 Myślęcinek is the largest urban woodland park in Poland, and a must-see for lovers of the outdoors. Here you will find a zoo, a Botanical Garden and a horse riding centre. When exploring the city, check out this unusual work of art hovering in the air. 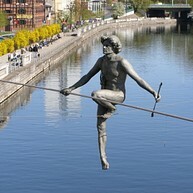 This silver coloured man hangs on wires just across the river and is considered to be one of the main symbols of the city. The author, Jerzy Kędziora, wanted to commemorate Poland's entry in the European Union. One of the nicest roads in Bydgoszcz, Mostowa Street is actually a bridge connecting the Old Town with the main street in Bydgoszcz. 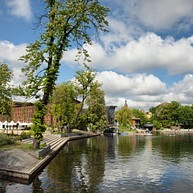 Here you can wander along the canal, eat, drink, and enjoy wonderful views of the city. 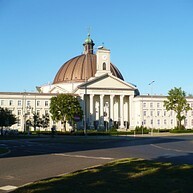 The Military Museum is located in the northern part of Bydgoszcz. It showcases permanent and temporary exhibitions related to the Polish Army. On exhibit you can find war artefacts like weapons, vehicles, and uniforms. The Archer Lady statue is one of the oldest statues in Bydgoszcz and has become a city symbol. 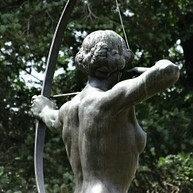 The sculpture portrays a naked woman spanning an arch. You can find it near the theatre in Kochanowski Park. Make sure to be at the Old Town Square, Stary Rynek, at 1.13pm or 9.13pm, to see the moving sculpture of Master Twardowski appear from one of the windows. A character from the old folklore, this wizard puts on an amusing show for about two minutes: he bows, waves and then disappears back behind the window. The Opera Nova is a modern music theatre located on the picturesque river bank near the city centre. This unique, large building will truly catch your eye. Come here for ballets, musicals, concerts, and of course operas.